The Solfeggio Sounds frequencies were often used in Gregorian Chants. The special tone of the chants imparted enormous spiritual blessing when sung and heard. The six original Solfeggio frequencies and 4 additional solfeggio frequencies have been analysed by physicists and musicians. All agree that they constitute a uniquely interrelated series of mathematically derived electromagnetic sound frequencies. They do not correlate directly with any conventional notes within known musical scales. This has led some to suggest that the Solfeggio Sounds are derived from the mystical "Music of the Spheres" and is the basis of the legend of the "Lost Chord". All ten Solfeggio frequencies have specific healing associations as they interact with the vibrational energies of the human body. Some theorists have considered the possibility that these electromagnetic frequencies are involved in the alchemical process of transmutation. 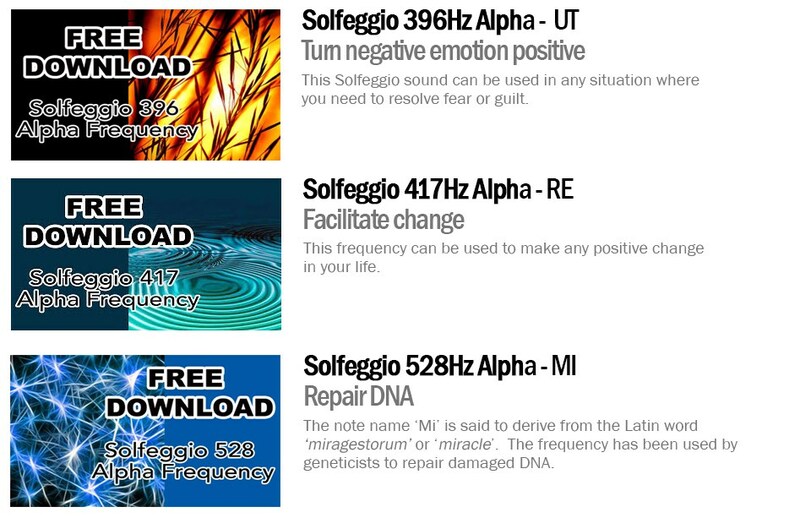 Click Here to get our free Solfeggio samples.